A plaque commemorates the Centenary of Rugby League and the site of Rugby league in Gympie. Rugby league was first played at Gympie in 1910, at the Normanby Hill Grounds. The Gympie League was formed in the following year. Since 1935, Albert Park has played host to most of the district’s most important matches, including games against major touring international teams. 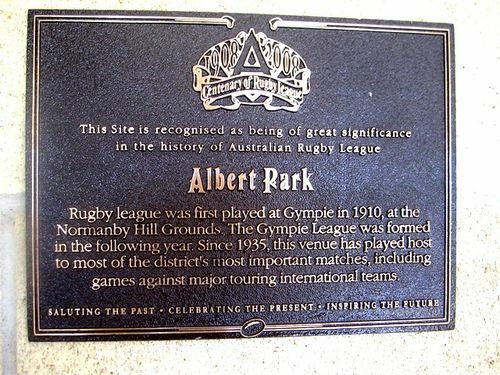 Rugby league was first played at Gympie in 1910, at the Normanby Hill Grounds. The Gympie League was formed in the following year. Since 1935 this venue has played host to most of the district's most important matches, including games against major touring international teams.